Walk through our setup tutorial: adding your home entertainment devices, setting up one-touch Activities and learning more about the usage of your Smart Keyboard. Already set up and something's not working? Our troubleshooters and support articles will help set things right. Your Harmony Smart Keyboard gives couch surfing a whole new meaning. Stream media with easier searching and navigation, plus Harmony home theater control. Smart Keyboard allows you merge the remotes of up to eight of your home entertainment devices into one so you can, and should keep those other remotes out of sight! The Harmony mobile app will guide you through your setup. It helps you create Activities (or scenes) as well, so you're only one-button away from watching television or playing a game. Harmony Smart Keyboard enables text entry on computers, game consoles and connected media devices, and mouse navigation on computers and supported apps. Two AA batteries come pre-installed. Harmony Hub is the center of your home entertainment solution. 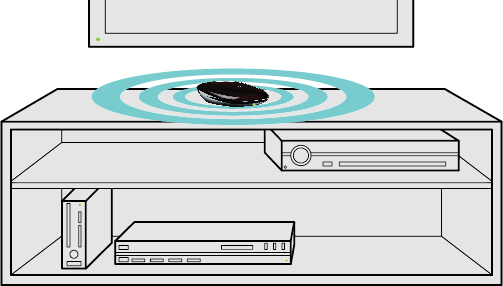 Placed near your television, cable/satellite box, game console and other equipment it uses Infrared (IR), Bluetooth, Wi‑Fi and the included wireless USB receivers to control your various devices. 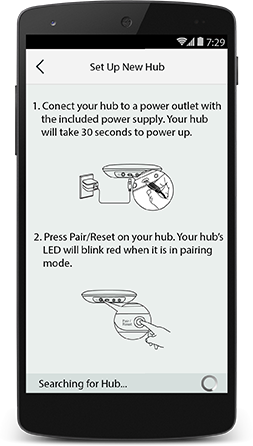 As Harmony Smart Keyboard relays commands through Harmony Hub, the hub must always be powered on. If one of your devices is not Bluetooth capable, a USB receiver may be plugged into its USB port to enable text entry. 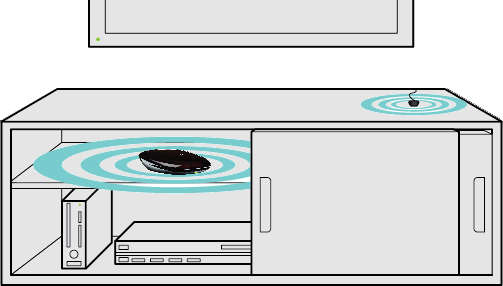 The USB receivers are connected to the hub via radio frequency (RF) that can function in typical living room environments and from behind cabinet doors. The USB extender helps connect the USB receiver into hard-to-reach USB slots. It may also be used to improve the range of the USB receiver if text entry responsiveness is poor. 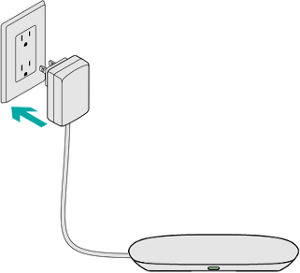 Use of the USB extender may or may not be required, depending on your setup. Pull out the battery tabs on the back of your keyboard. 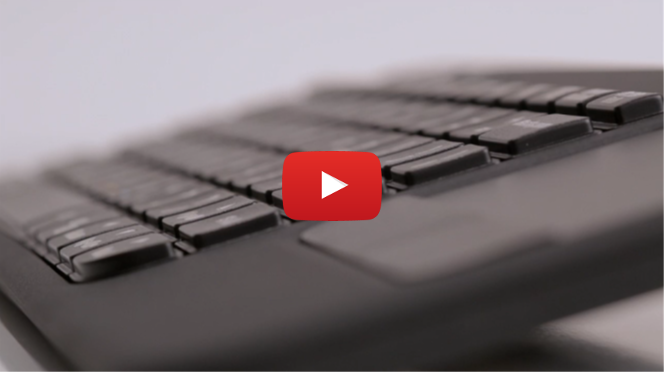 You'll be guided through several screens explaining how Harmony Smart Keyboard works. If you have a previous Harmony remote and would like to import its devices and Activities, you will be able to copy them over to your new Harmony Smart Keyboard. If you do not have a previous Harmony remote, select No, Set Up New. Turn the keyboard on or off using this switch. 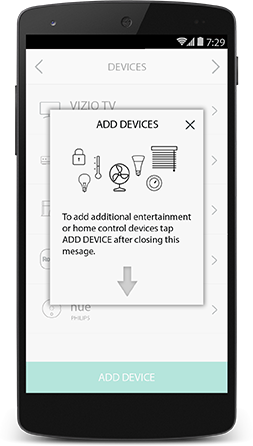 When off, the Harmony mobile app may still be used to control your entertainment system. When used in combination with the Fn key, the colored keys can navigate PS3, Xbox and some cable/satellite box DVR menus. These keys may be customized using the Harmony mobile app and have unique functions depending on the Activity you're in. Harmony Activity buttons provide one-touch access to 6 different Activities, 3 with a quick press and 3 additional with a longer press. View a connected computer on your TV, Watch TV, Watch a Movie, or any of the custom Activities you may create from the Harmony mobile app. The trackpad navigates connected computers and or game console/ smart tv apps that support mouse navigation. Use two fingers to scroll web pages up & down, tap to click, and if using Windows 8®, edge gestures are supported. 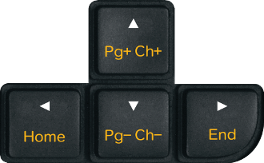 The Windows key also functions as the 'Menu' button on devices such as PS3 and Xbox, and as the Command key on Mac computers. Quickly access 3 commonly used buttons. They may be further customized using the Harmony mobile app and are unique for each Activity. When holding Smart Keyboard with two hands, you may use your right thumb on the trackpad while using this conveniently placed extra left click button with your left hand. When used in combination with the Fn key you may also Page Up/Down on your computer, or Channel Up/Down on your cable/satellite box. Create as many Activities as you'd like and tweak what commands your keyboard buttons send. Harmony will pre-populate these with smart defaults, but full customization is in your control. Also, you can customize what commands appear on your mobile device. Understanding Activities. Unlike other universal remotes that may control devices individually, Harmony controls an Activity such as Watching TV or Playing a Game. You don't need to choose which device you want to control. Start your Watch TV Activity and your volume will automatically control the stereo, and channels will automatically change your TV or cable/satellite box. Watch this video to learn more. Keep your devices in sync. To help keep your Harmony in sync with your devices, avoid turning your television, cable/satellite box and other devices on and off manually or by using their original remote control. If something didn't turn on then use the help feature. Harmony Help feature. Did one of your devices not power on, or switch to the correct input? The Harmony Help feature, located in the Harmony mobile app will ask you a series of questions to bring everything back in sync. Watch our video to learn more about Harmony Help.